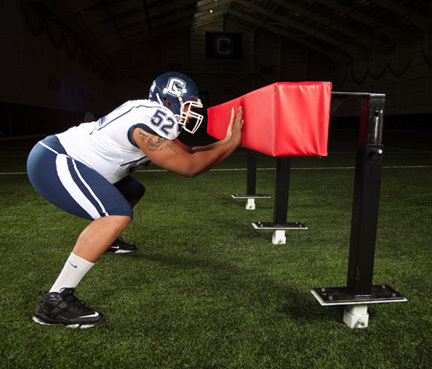 The SHIVER BOARD SLED is used to teach proper footwork, body position and blow delivery. Use the Board to practice a good two hand strike while developing the habit of hitting with the heel of the hand. Players can work on quick reflexes to deliver the strike with speed and power. Developing the proper “lock-out” technique with the elbows within the frame of the body and the thumbs up is a vital defensive fundamental. Excellent for working out a group of players. Allows maximum repetition. Use it during pre-practice and post-practice routines. The Board has three height adjustments: 36", 42" and 48". The height adjustments allow a good bent knee posture from different defensive positions. The Board is 10' long and mounted on a Gilman sled chassis. The striking surface is 6" thick and 12" high. 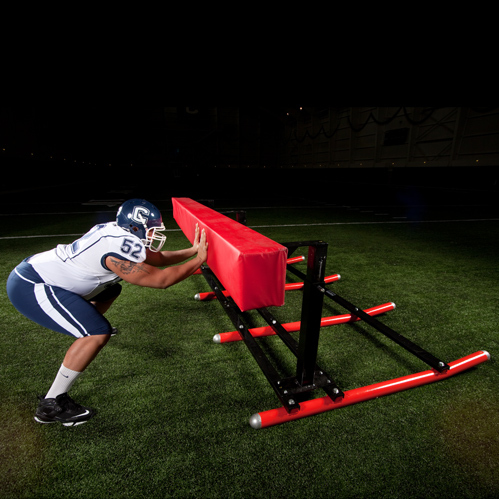 Optional coaching platforms can be added to increase the weight of the sled. "The coaching point is to teach proper body position and blow delivery!"